The Sonatas for Violin and Piano. Itzhak Perlman (violin); Vladimir Barenboim (piano). DG Collectors Edition 463 749-2 [four discs] [279'56] Recorded 1983-86. For those who like committed performance, albeit at some remove from claims to total authenticity, this set is an absolute gift. 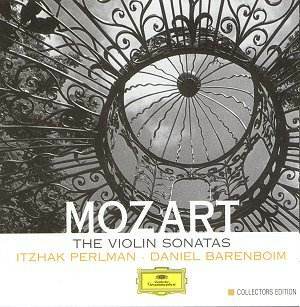 Perlman refuses to tiptoe around the earlier sonatas as if they are made of precious porcelain. Instead it is obvious he has given them his utmost attention and is fully aided and abetted by Barenboim. Thus, in the very first sonata (G major, K301/293a), the first movement (of two) is lyrical and expressive, but still within stylistic boundaries. The Allegro second movement is gallant and shows Perlman and Barenboim affectingly sensitive to minor-mode colouring. The pair brings the same eloquence to the Andante grazioso finale of the next sonata (E flat, K302/293b). More than anything else, one is aware in listening to this set that one is on a musical journey. If you listen chronologically (in the hands of the Perlman and Barenboim duo, not as onerous task as you might think), the growth of Mozart's thought becomes a marvel to experience. Already, the variations of the finale to the Sonata in A, Op. 305/293d explore new pastures, the textures verging on the dangerously sparse. Rhythmic pointing is a joy throughout these four extremely well-filled CDs, from the smart rhythms of the Tempo di Menuetto of the E minor sonata (K304/300c) to the busy, alive Allegro of the F major Sonata (K377/374e) and the bright-as-a-button first movement of the E flat Sonata, K380/374f. Space precludes listing all the joys this collection of performances will bring. Perlman and Barenboim's love of chamber music shines through and as the sonatas gain in maturity there seems to be a cumulative sense of identification from the performers. Barenboim in particular stuns with crystal-cut passage work, and he rarely strains the tone of the piano (as he has been known to in Beethoven, for instance). The A major sonata, K526 finds the pair responding to one of the pinnacles of Mozart's chamber music. Here Mozart (concurrently working on Don Giovanni) is not afraid to experiment with open textures in the longest slow movement of the set (nearly 12 minutes long). Mozart's violin sonatas are sometimes not given their full due. Perlman and Barenboim set out to redress the balance, and we would do well to heed them. The booklet note, by the noted scholar Stanley Sadie, is exemplary. A special achievement all round.